Rep. Rosemary M. Brown takes the pledge to STASH to Avoid a CRASH as she launches her distracted driving prevention initiative. EAST STROUDSBURG – Rep. Rosemary M. Brown (R-Monroe/Pike) is calling attention to the major distracted driving issue, not only in the Commonwealth but throughout the nation, by launching her “STASH and Avoid a CRASH” initiative. This initiative coincides with her distracted driving legislation, which she has recently reintroduced. The goals of “STASH and Avoid a CRASH” are to encourage the public to store their cell phones in their glove compartments in the hopes that it will curb drivers from using their cell phones while driving their vehicle and promote overall driving safety. While cell phones are safely stashed in the glove compartment, drivers will still have the ability to accept or deny phone calls via their car’s Bluetooth technology. Additionally, should drivers need their cell phone to serve as their GPS it is suggested that they purchase a docking station that attaches to their dashboard, so their cell phone remains out of their hands. 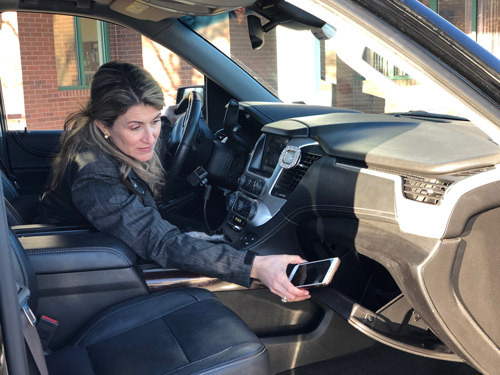 Brown has again introduced her hands-free driving legislation to prohibit calls on hand-held mobile telephones in Pennsylvania, except with the use of hands-free accessories, while operating a moving motor vehicle. Also, no person under the age of 18 years of age would be permitted to use ANY hand-held mobile telephone, including one with a hands-free accessory while operating a moving motor vehicle. The punishment for violating this law would be a $200 fine, with $175 of that fine going to a Distracted Driver Fund to help educate young drivers on distracted driving and its consequences.